is it just simply that I’m now nearing the end of my rapid wealth generating journey and others are a little earlier on in theirs. To make sure it’s not number 1 let’s spend some time going back to fundamentals to understand if bonds combined with equities are still doing their thing. I’ve been able to source 10 full calendar years (not quite for the bonds as I’ve only been able to go back to 29 March 2004 but close enough) of total return bond and equity performance covering the years 2004 to 2014. The bonds are the Markit iBoxx GBP Liquid Corporates Large Cap Index and the equities are the FTSE 100. Armed with this information I can calculate the annual return possible for everything from 100% bonds, through various mixed bond/equity allocations to 100% equities for each year. I can then calculate the volatility (I’ve used standard deviation to represent volatility) for each allocation for the 10year period. 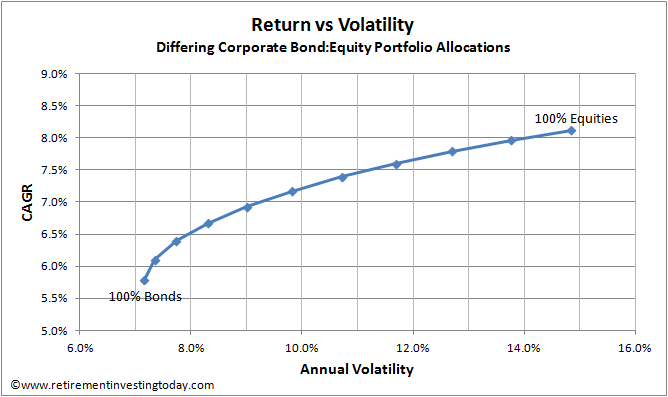 The 100% Bonds portfolio has volatility of 7.2%, the 40% Bonds/60% Equities has 10.7% while the 100% Equities has 14.8%. This is all shown in my first table below. So far so good. Adding bonds to an equity portfolio looks to still be reducing volatility. Think you’re hard and can just accept that volatility ride with your 100%? Let’s run a little simulation. You’re ‘young’, it’s the start of 2008 and you have managed to squirrel away £10,000 into the FTSE 100. By year end you’ve just ‘lost’ £2,833 and you’re probably still sleeping well. Now you’re a ‘little greyer’, it’s again the start of 2008 but you’re now retired with £1,000,000. By year end you've just ‘lost’ £283,330, might be starting to think about sequence of returns risk and maybe even wondering why you didn't have a 40% Bonds/60% Equities portfolio which would have left you £77,000 and multiple years of expenses better off. Next let’s take all those annual returns, assume each bond/equity portfolio is rebalanced back to nominal allocation at the start of each New Year and calculate the compound annual growth rate (CAGR) of each portfolio. The result is shown in my second table below. 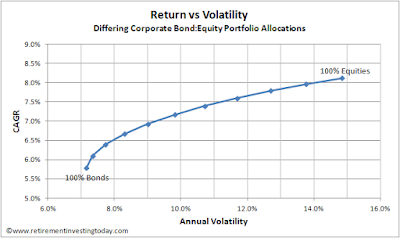 Let’s now plot each Bond/Equity Return (CAGR) against the Volatility (risk). One of the very few free lunches in investing seems to still be holding true. 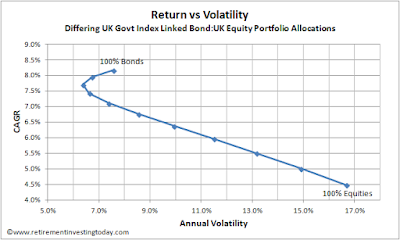 A 40% Bond/60% Equity Investor over those 10 years has just received 91% of the return of the 100% Equity Investor but has only received 72% of the volatility. By now some of the more hardened amongst you are probably already out of your chairs, waving your fists and shouting – “RIT, you’re an idiot and to hell with your sequence of returns nonsense, you should just ride out the volatility and take the nice juicy 8.1% return that comes from the 100% Equities portfolio!” My response is let me show you another chart. The Equities are still the total return of the FTSE 100 but this time the Bonds are the Barclays UK Government Inflation-Linked Bond Index and we’re now over 7 years rather than 10 years (not a deliberate timescale but simply because I could only get 7 years of index linked gilt data). The chart nicely demonstrates another reason I hold bonds (and cash, P2P, gold, property, equities from multiple countries, government index linked gilts, NS&I Index Linked Savings Certificates and corporate bonds) - ‘Equities’ outperform ‘Bonds’ until they don’t. You've hit the nail on the head, and it will seem so obvious in hindsight I'm sure. I see bonds as being about spreading the risk, especially as my fund grows. Working in financial services even my earnings have a link to financial markets, so having some bonds seem a helpful counterbalance. In hindsight it will always turn out to have been too much or too little, but I can't know which from today's vantage point and in the meantime I get to sleep at night. I agree very much with your last sentence but knowing the efficient frontier is of course impossible in advance. Instead I've just set myself a modest, I believe achievable, real return target of 4% which means I can hold a diversified portfolio, allows me some free lunch when available and certainly allows me to also sleep at night. There's an article in this morning's Tel advocating that some of one's cash holdings should actually be as cash: folding stuff "under the mattress". I can remember doing that in 2007: what if there were to be supply chain disruption, bank collapses etc? So, some wonga, some tinned food, bog rolls, bin bags and kitchen foil. Some hundreds of pounds' worth cost us little in interest but added quite a bit to our comfort. I didn't go as far as gold sovereigns though. Wish I had, but I've nowhere secure to store them. Of course, if I lived in the US I'd also want a machine gun and some RPGs. I'm not a tin foil hatter (well I don't think I am anyway) but I always keep a few £'s around just in case. It might help if we ever get another bank run but the main reason I hold it is just in case we see bank incompetence (for example a systems crash which takes time to restore) or my account is blocked for "security reasons" (this has happened to me, I was unable to unblock it via the Indian Call Centre and ended up in a branch some days later) to name but two. An excellent post, RIT. I agree with you. I have no exposure to bonds/gilts at present. However, I do plan to. I started writing a post on this a while back but it is far from finished. Now my portfolio is at a not insubstantial size I think it is time to think "gilts" to provide some ballast. My investments are not 100% equity. Far from it. At last reckoning it was about 67%. The rest was composed of about 28% cash and 4.5% p2p loans. I think you may be right that the Bull market has made people bond averse. Especially as bonds have been quite unattractive recently. But that is--and will--change I am sure. As I am still in my mid-20s I am happy having a pretty heavy equity exposure. However, I am planning to build my bond portfolio modestly over the coming years. Thanks again for the great post. Really interesting. Just in case my post made you think otherwise I'm not for a second suggesting bonds have been unattractive or are good value. My crystal ball doesn't work very well - it's why I tried and failed at trading - but I actually think gilts look quite expensive and I don't think I'm alone. That said the same was being said by the experts in 2013 and then index linked gilts went and added 18.8% total return over 2014. Who knows what 2015 will hold but I know whatever it is I have some of my portfolio diversified into them. Thanks for the reply, RIT. No I did not coming away thinking that, so you're safe there. Sadly, my crystal ball is pretty fuzzy as well. However, I agree that gilts look a little expensive (for the long-term) at present. I am still feeling my way as to when best to start my bond/gilt element. I am in no rush. I agree though, it would be good to have some diversity in holding them. or, 'the 30 year bull market in bonds will continue until it doesn't'. I think the debate now is whether bonds have lost their traditional risk dampening characteristics and are now actually increasing portfolio risk. Hence a view that cash or near cash is just as useful. Any bond exposure should be targeting short to medium duration funds only in my humble. I just use NSI index linked as a proxy and it would be nice if they became available again. I agree with you, Ruby. Analysts can chart the past 7 - 10 years of bonds all they like, but these have been very abnormal years and the warning signs are loud and clear. Cash or near cash is safer, as are real assets such as commercial property. I hold equities, property and cash or equivalent, but no bonds and no gold (the latter's "value" being almost entirely a matter of sentiment and sentimentality). 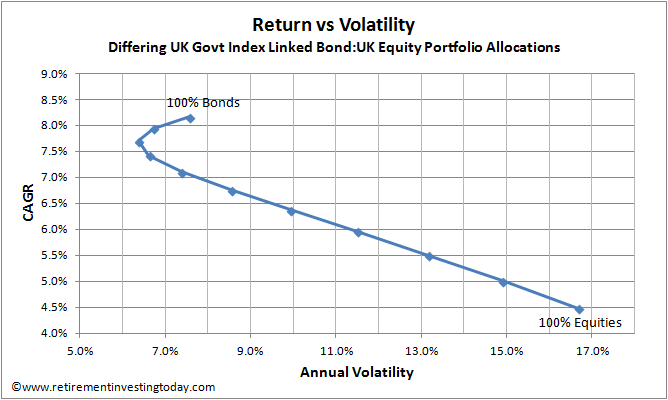 Bonds are good to manage overall risk of the portfolio. Risk is volatility times position. So, given some fixed risk of your portfolio, if your position is outperforming the market, then the risk will grow as your position grows. The way to balance the risk is to increase the position of a component with lower volatility which would be fixed income holding. Risk is the possibility of permanent loss of capital. Volatility is fluctuation in the value of capital. Bonds currently offer real prospect of the former - risk for no reward as some sage put it. Equities always offer prospect of the latter. If one wants ones bonds to preserve capital one has to stay short at the cost of any real return. Possibilities, fluctuation, prospects - those are the words from the world of popular articles in pseudo-financial publications. Per industry accepted methodology, the risk is measured by standard deviation/variance (volatility) which is estimated based on either historical data or monte-carlo. Be that as it may, I think you will find that Charlie (as in Warren and Charlie) disagrees with you... 'using volatility as a measure of risk is nuts. Risk to us is 1) the risk of permanent loss of capital, or 2) the risk of inadequate return. Obvious when one thinks about it. "Per industry accepted methodology, the risk is measured by standard deviation": all that demonstrates is that abuse of the word "risk" is widely held to be beneficial to the abusers. You guys are great in writing statements about interpretations of 'risk' word. Well done ! Apologies if this has been covered elsewhere, but do you have a specific amount in pounds, shillings and pence that you are aiming at to reach financial independence? Hi RIT, good analysis of what is probably THE basic passive decision (stock/bond split). I can see little reason for a passive investor to stray too far from 50/50 or 60/40 stocks bonds. They have both been tried and tested since the dawn of time (almost), and they're easy to remember. My son's JISA is 60/40, split between five ETFs - three equity funds (FTSE 100, FTSE 250 and a World Index fund) and two bond funds (Gilts and global investment grade corporate bonds). I could get more scientific about it but the marginal gain under most outcomes is likely to be next to nothing. And seeing as Harry Markowitz just had 50/50 it's good enough for me. An excellent post, and I am guilty as charged. Sorry! In my defence I don't have your brains. Maybe my situation justifies it as nearly half of my required retirement income is from a predictable and dependable defined benefit pension (with some inflation protection), which you could argue is a reasonable proxy for bonds? Even if you were to accept my plea for mitigation I suspect you would say half of a portfolio is still underweight in bond-like holdings for someone about to retire. Well I've stress tested my overall holdings for a 2007-like market collapse. My assumptions are equity values fall to 55% of their previous values, but the yield increases from 3.6% to 5.75%. Given these assumptions (which may be wrong) the equity income drops by a little less than 14%. Factoring in a safety margin, lets say the downside could be a 20% drop in equity income. As it happens this is easily covered by my “fun” budget, and does not even touch my “further investment” budget. So for me (and I'm not suggesting anyone else has the same circumstances) it is not a real risk to my well-being & I can live with it. So whilst I should do as you say, and will most likely do so when yields look more attractive, I remain a bad boy for now. My situation is different to most people who do not have a defined benefit pension, so think it at least partly depends on the individual and their circumstances. Therefore I agree with your central point of the post, and people should not try this at home! More generally, and apart from the bonds discussion, I think it helps to think of the risk from volatility as needing to sell (or being tempted to sell) at times of high volatility when prices are low. This applies whatever the asset class. I hope this comment does not offend! I enjoy your blog and would hate to be banned! Having bonds is an investment portfolio is certainly the right thing to do. But what about ETFs? Do you think portfolio that consists of ETFs and reflects your key parameters, like risk tolerance, liquidity preferences, time horizon is able to generate good and stable returns? ETFs are widely discussed in the media and many people (especially the younger guard) choose these investment products. The table of total return is interesting. Despite the difference in volatility, at no point did the 100% equity portfolio have a lower value than the 60% equity 40% bond portfolio. I would not mind the volatility if the absolute value of my portfolio always beat the alternatives.